the sensation of having learned something. It is said that British passengers on the homebound P&O ships, after reading “A passage to India”, in disgust threw their copies into the dark waters of the Bay of Bengal. Symbolic as the gesture was, it remained a stupid move, for one knows that where books are drowned, people will end in drowning other human beings. What those people didn’t know, while watching Forster’s writings disappear in the wake of the ship, is that they just endorsed his message: For people to “connect” across different cultural and social barriers, it is nearly impossible to overcome the prejudicial inhibitions raised on both sides of a relation. Forster’s “A passage to India” has patiently been waiting on my “TBR “- list for quite a long time. It was Frank Kermode’s review of Forster in his book “The use of error”, where he stated that the use of symbols in “Maurice” was “inert and self-indulgent” compared to those used in the “India” book, that revived my interest in the British writer. I decided on the spur of the moment to set aside other planned literary discovery tours and switched to “The Passage”. As I did anticipate an excellent read, I approached Forster’s masterpiece with the necessary caution. Instead of choosing the more obvious, but “vulgar” soft cover Penguin Classic paperback, I purchased the “irresistible repackaged”, Hoddor & Stoughton hardcopy edition, wrapped in an agreeable pink cloth strewn with fine Cashmere motifs and interspersed with small drawings of Dr. Aziz’s bicycle. Ironically it turned out to be much cheaper than the pocket edition as I bought it second hand from the Oxfam bookshop. By reading this book, I felt like I pleased more people than just myself. As expected, “A Passage”, a story most of us know from the David Lean movie, turned out to be a fluent read with its agreeable short chapters, its well structured storyline and the occasional humorous sections. It is also a very interesting read, not only for the sake of the story, although it is really captivating in a number of ways, but also for a few important literary critical issues. Most blurbs on the back cover of recent editions try to catch our attention by asking the mysterious question “What did happen to Mrs. Quested in the Marabar caves?. What unspeakable act indeed caused the young English woman to flee her companions from the picnic party so kindly organized by the Indian doctor Aziz? What happens or what does not happen to Mrs. Quested is central to the book. Literally it is the culminating part of the narrative, which unfolds like a triptych with the tree parts titled Mosque, Cave and Temple, the first part describing the string of circumstances that lead to the fatal occurrence, the third chapter describing the aftermath or the consequences of that same occurrence. The challenge of the story, but at the same time its very strength is that this central part takes place in a mysterious cave, a dark and empty void, a muddle which hides all truths and leaves us as disturbed as the different protagonists engulfed by the dramatic happenings. The Setting of the story is India during the British Raj, the time, somewhere between 1912 and 1921. Miss Adela Quested, an unmarried young woman, is accompanying Mrs. Moore on a visit to India to see her son Ronny Heaslop who is the Magistrate of the fictional city of Chandrapore. Pun intended or not, Mrs. Q is on a quest not only for a husband ( She is planned to engage with Ronny ) but she also wants to see the “real India”, whatever she means by that. A Muslim doctor, Dr Aziz, a considerate and friendly young man who works in the British hospital, proposes to visit the major landmark in the neighborhood, the Marabar caves. A friend of Heaslop, Mr. Fielding is to be the chaperon for the two ladies, who have to take the early train to the caves in company of Dr. Aziz. Fielding misses the train and the two women are left alone with the doctor. The heat, the number of inquisitive people, the smells and the sounds and their own prejudices make the trip for the two woman rather oppressive. In the dark and threathening caves with their strange echo, things become too much first for Mrs. Moore, who interrupts the visit in a claustrophobic panic. She decides to stay behind and Adela proceeds further alone with Aziz and a single guide. Then something happens. We do not know what exactly, but Mrs Quested suddenly flees the caves, runs of the mountain and hitches a ride back to the city from a passing car. The reactions vary from puzzled to astounded but everybody expects to meet Adela Quested again at the railway station. Not Adela awaits the picnickers but the police who arrest Aziz on the spot on a charge of attempted molestation of the white woman. The inculpation of the doctor, uncovers the underlying social and racial tensions and strongly challenges the relationship between the British colonial community and the Indians. A court case follows with a “coup de theatre” and the readers are left to pick up the scattered remains of the various relationships. Can trust be regained ? I found “A Passage” a very intelligent book, free of prejudices and showing a good understanding of the underlying mechanism of Racism. More than an attack on the British Raj, which if so, would be inadequate, it’s main subject is about the inability of people to communicate over social, racial and cultural barriers. It is interesting to hold “ The Passage” against the literary theories, Forster presented in his “Aspects of the Novel”. Did he follow his own advices ? Well he does and while I will not go into details, it is for instance interesting to compare his theory of flat and round characters against the “dramatis personae” of the novel. I said earlier that “A passage” is interesting in a number of ways and this is proven by the fact that this book is “gefundeness fressen” for the contemporary critical approaches of Post – Colonialism, Feminism and Gender theory. These approaches challenge our real understanding of the book. Adela Quested according to the Feminist theory is no more than a pawn in the all – male tussle between the British and Indian community. And what about the beautiful impervious Punkah–Wallah, described with relish by Forster, is it the author repressed homosexuality peeping through ? It took Forster 10 years to finish his book. He started enthusiastically in 1912, just after a first journey to India, but then he got terribly stuck in the key chapter 14, the famous cave chapter, and abandoned his project in the turbulent year 1914. 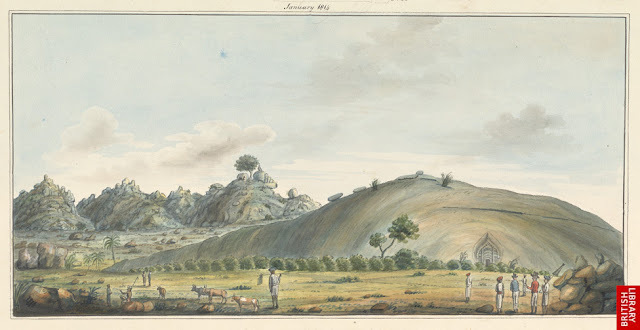 Forster toiled with the dreadful occurrence that did or did not happen in the Malabar cave, not knowing what to do with it, not knowing what to write. Some drafts have survived which show that he tested several storylines, but could not chose one. It was only after his second visit to India, in 1922, that he finally succeeded to solve his creative problems and that he finished his “Passage to India”. With hindsight, we know he chose the best option and Forster confessed finally to his audience that he too did not know what had happened to poor Mrs. Quested in the Malabar cave. It was of course the only option, he saved his book by doing so. The long delay it took to finish “ A Passage to India” is according to Gabriel Josipovici, Weidenfeld Professor of Comparative Literature at Oxford, symptomatic for most true Modernist writings. The difficulties to get a work written is according to him Art arriving at a consciousness of its own limits and responsibilities. While Forster’s very humane and traditional way to bring his story, completely differs of what his friend Virginia Woolf was doing, he was first recognized as a realist. But subsequent critics focusing on Foster’s themes, his use of symbols and imagery did recognize strong Modernist features. Forster being a contemporary of Joseph Conrad, Virginia Woolf and Henry James, was well aware of what was happening around him. But he did it differently. Forster works show that he was a transitional writer bridging the evolution from Edwardian realism towards Modernism. Forster shows us that one can be a Modernist without the iconoclastic writing of the likes of Joyce or Faulkner. The omnipresent threatening caves are a good example, they are at the center of the book and the essential symbol of what Forster wants to tell us: the difficulties of communication and the failures of language. When the visitors enter the cave and speak to each other, the echo intervenes, disturbs the spoken words and changes the meanings which are to be understood. Even when people are open to other cultures, well-wishing and kind, like Aziz, Cyril Fielding and why not Mrs. Quested too, in her naive tourist way, communication is heavily distorted by the differences in Class and Culture. That it is nearly impossible to communicate is endorsed by the post colonial critics who show us that even the classic interpretation agreed on by Western academics is not free of prejudices. According to the Post – Colonial criticism, Forster, despite his sensitiveness and respectful approach of the subject is still not as disinterested as he would like. The use of a word like muddle for example to describe what we Westerners see as chaos is not perceived as such by the Indian communities. Characters like Aziz or Godbole are heavily anglicized, all others Indians are just strange. His description of the general inefficiency of India, the chaotic situations in the railway station, the unreasonableness of Aziz, all seem to show that E.M. Forster is implicitly justifying the colonial rule he seeks to criticize. In the end, with all the complexities of interracial relations, it seems we all happen to live in a dark cave. Only those close enough to us, only those close enough to join hands with, are able to understand our words undistorted. All others in the cave hear our voices heavily transformed by the booming echo. It is not a cheerful conclusion, I agree, but at least it is lesson we can use.